Florida Conference Exploration 2011 Attendees. 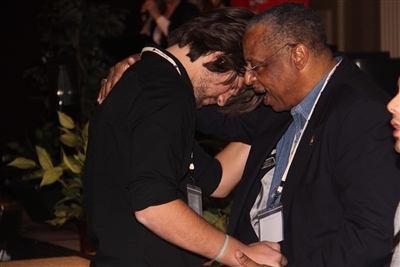 Speaker after speaker told young adults attending Exploration 2011 that The United Methodist Church needs them to carry God’s word to their own generation – and speaker after speaker assured them that God will equip and support those who accept that call. The Rev. Shalom Agtarap, the 28-year-old pastor of Ellensburg First United Methodist Church in Washington State, told the 650 people attending the national event in St. Louis, Mo., that she had been where they were now. The culmination of the discernment event sponsored by the General Board of Higher Education and Ministry was Saturday night’s commitment service, when 172 young adults signed a card saying they felt called to ordained ministry. Another 131 said they were still discerning, and 26 said they were not called to ordained ministry. “I have felt God’s spirit throughout this event,” said DJ Del Rosario, GBHEM’s director of Young Adult Ministry Discernment and Enlistment. He said the names of those who committed to ordained ministry will be sent to their annual conferences so clergy there can follow up. Bishop Robert Hayes Jr. and the Rev. Adam Hamilton both told personal stories to illustrate why younger elders and deacons are needed. Hayes, episcopal leader of the Oklahoma Area of the UMC, spoke of his son, Eric, who left the church, telling his father that church wasn’t relevant. Then one night, he got a call from Eric, who told him that he had just attended a contemporary worship service at a United Methodist Church and given his life to Christ. He spoke of how grateful he was that someone had been able to bring the gospel to his son. “This generation belongs to you, not to me,” Hayes said. The Rev. Adam Hamilton, founding pastor of the 18,000-member United Methodist Church of the Resurrection in Leawood, Kan., told Exploration participants that the church has no future without them. “The people who are going to teach us how to do church for this generation are sitting in this room,” Hamilton said in the opening worship. He spoke of his own daughter, who no longer attends church despite growing in a home where church was a central part of life. 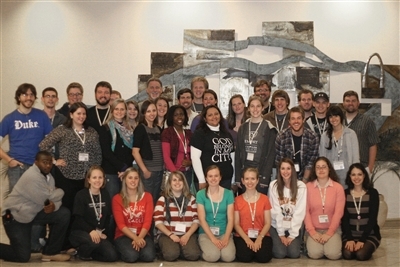 In addition to attending worship services, young adults at the conference attended workshops on topics such as what to expect in ministry and being a young adult in ministry. They gathered in small groups to discuss what they had heard and spent time praying in the sacred space area, where they could walk a labyrinth or sit in a quiet space for silent prayer. And they could speak with representatives from the 13 United Methodist seminaries. 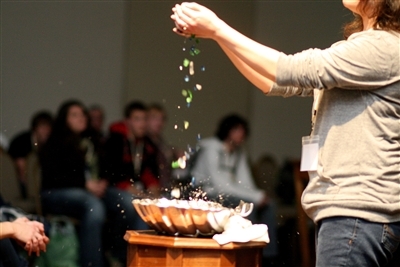 "The quality of the event, the scheduled activities were very good," according to David Sippel, Florida Conference Director of Ministries with Young People. "But, the fellowship that occurred between sessions was great!" He said those times truly gave participants the chance to connect one-on-one with others to explore their call to ordained ministry. Alex Harriman, a Virginia Tech junior from Apex, N.C., said the event solidified his belief that God is calling him to ordained ministry. “Last night [the commitment service] everything kind of clicked,” he said. Brian West, a third-year student at Methodist Theological School in Ohio, who is on the elder track, said he first came to Exploration in 2003 when he was beginning to feel called to ordained ministry. He thought it was fitting that he was back as a seminary representative to talk to young adults considering God’s Call since Exploration had helped him discern his own call. Anthony Waley, a college junior from Salisbury, Md., said Sunday morning that he is still trying to discern his call as Exploration drew to a close, but said he does feel God is calling him work with youth. He is not sure if he wants to be ordained. Anitta Milloro, a student at North Central College, said this was her second Exploration event. She said this time, she knew what to ask the seminary representatives and had spent a lot of time getting information, even though she’s still trying to figure out what she is going to do. “I have a passion for mission and also for church planting,” Milloro said. *Brown is associate editor and writer, Office of Interpretation, General Board of Higher Education and Ministry. Joey Butler, editor of Young Adult Content for United Methodist Communications, Nashville, Tenn., contributed to this story.